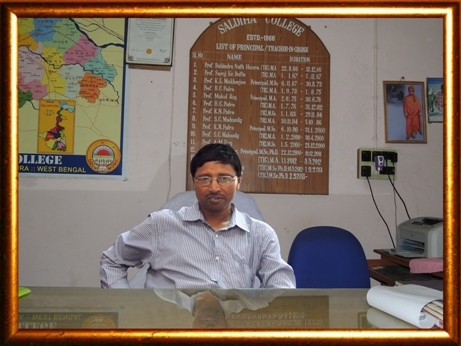 As Principal of Saldiha College, it gives me great pleasure to welcome you to our website. Saldiha College was born out of the sweat, toil and vision of its founders. With a long cherished deep desire to give quality education to the students of this economically backward rural area, an enthusiastic group of people of surrounding villages under the leadership of Late Ashwini Kumar Pati, a great social worker with his philanthropic zeal along with the vision of “Social Transformation through Dynamic Education”, sowed the seed in 1966.At the height of adversity these visionaries had only thought of creating a temple of knowledge. The tiny seed, now growing into a mighty tree, has been very fondly offering numberless education lovers its calm shade throughout years. Our endeavour, year after year, has been to keep adding to that temple so as to create wonderful windows of opportunity for all who pass out from here. We are a dynamic institution that believes in staying ahead of the times. As I walk down the hallways of the College everyday, I can hear the chatter of eager minds, the shouts of excitement from the victorious students. The perpetual energy, movement and enthusiasm permeate the atmosphere at Saldiha College. We value individualism, creativity and innovation and strive to nurture them in our students. Education has always been a thrust area of priority for the governments of the contemporary world. India, being a predominantly rural polity, has rightly realized that it can't think of any meaningful accomplishments without taking its rural masses on board while designing her expansion plans in the field of elementary as well as the higher education. The differently-advantaged rural youth, from its side, need to make the best possible use of the facilities being provided at their door steps, acquire the skills of a responsible citizen and finally start contributing in approaching the challenges facing the contemporary societies. This Degree College shall be aspiring to serve as a facilitator and service provider for all the interested and motivated students of the area and try to build the necessary infra structure, services and facilities to equip them with the required skills and an urge to compete and contribute alongside their better advantaged urban counterparts in the noble task of the service to humanity. The endeavour to launch this College Website is a step in this direction. The importance of education in the life of an individual cannot be overstated. It shapes individuals in their formative years and imbues them with values that would govern all their choices in life. It is said “If you are planning for a year, sow rice; if you are planning for a decade, plant trees; if you are planning for a lifetime, educate people”. Indeed, one can even say that the quality of education will determine the destiny of the nation. For me, Education does not mean providing answers. It means equipping the pupil with the means to find the answers for himself and within himself. Education empowers students to discover themselves – who they are as people. Within each student is a doctor, an engineer, a teacher, a social activist, a sports person, an environmentalist, a poet, an author or an economist. The teachers support them in channelizing resources vis-à-vis their dreams thus, sustainably generating civilized and productive human capital for serving our motherland in line with the motto “Service Before Self”. We describe ourselves as a learning community because we believe that we are all learners - teachers, students and parents - learning from and with each other. We describe ourselves as a community in which parents, teachers and support staff work in partnership with each other to advance the learning and growth of the students. Our vision is “Growing and Nurturing Excellence, Wisdom and Service”. Our mission – “Learning to Live; Living to Serve”. Our motto is “A More Excellent Way”. Dear Students, “A desire can change nothing, a decision can change something but a determination can change everything”. We may forget so many things that we learn, but while learning, let us not forget that we also build something, our Personality and Character. While we study, something deeper is going on, which we are not aware of; we are laying the foundation of courage, perseverance which will have a lasting influence. The future belongs to you; you need, therefore, to prepare yourself for an active participation in the world. This participation demands that you become well informed, develop yourself like a pioneer and ultimately grow as responsible men and women. Or walk with Kings - nor lose the common touch. I, along with my team of silent workers and dedicated faculty, intend to build on this strong foundation and raise the standards in all spheres, to the zenith. Since its acquisition of the NAAC-accreditation (Grade B+) in 2007, Saldiha College has been looking to further enhance the quality and scope of its educational initiatives and to increase and improve its infrastructural facilities. We have modified our infrastructure time and again to facilitate easy and computer based learning for our students. Our faculty believes in constantly updating their knowledge through research and the number of UGC minor and major research grants as well as the development grants that we obtain each year, bears testimony to that fact.We are a completely student-oriented and student-centric institution and believe that a judicious blend of modern techniques and traditional values and beliefs will sustain us and bring success to our students. My efforts lately have been to make Saldiha College an environment friendly college. I strongly believe in the adage, “We do not inherit the earth from our ancestors, we borrow it from our children.” Time is running out for all of us and we need to rectify our erroneous way of plundering nature, or else nothing will be left for our children. My aim is not only to be an able administrator but also to be a friend, philosopher and guide to students one whom they can count on and trust at all times. I assure you that my doors will always be open to the students and their parents for any suggestion or guidance. As Principal of the College, I appreciate guidance of our Governing Body and participation of staff and students in the endeavor towards excellence. The college is focused on its vision and the strategies for carrying it out for the socio-economic development of the backward areas surrounding Saldiha. I welcome your interest in the College and hope you enjoy browsing our website. My whole hearted wishes and thanks to all the user of our college website. We strongly believe in "there is no substitute for hard work”. The work! !, “More you work more you develop your ability to work. !” But of course, work without vision is a journey without direction. A warm welcome to you! Join us to work with vision!